Another road trip and it's off to an area we have always wanted to visit but never got around to: the area known as ‘green Spain', in the north-west between the Atlantic and the mountains, then looping back through northern Portugal and Salamanca. Ian and I passed through this area last year on the way to the ferry from Santander and liked what we saw: this gave us the impetus to make the trip this year. We stayed in ten locations, including three former palaces, in four Spanish autonomous communities and two Portuguese provinces; we visited seven world heritage sites and many churches; we walked 120 miles and drove 2000 miles by car; we sampled some surprisingly good local cuisines, with lots of queso and jamon and uncountable varieties of tapas. We experienced the Camino Santiago, vicariously, and had lunch at the End of the World. We found spectacular countryside — huge empty beaches, mountains, gorges and remote picturesque villages. We also experienced a wide variety of weather — it’s not green without a fair amount of rain — and maybe this is the reason it’s less popular with tourists. But for us it was fine, all in all a great region to explore. 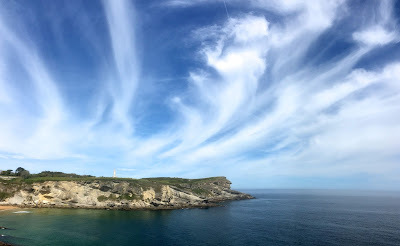 Santander proved as good as it looked from a first glimpse last year, which is what prompted us to plan this trip. Once again we crossed by Brittany Ferries to the port at Santander, and the 24 hour crossing was as smooth and pleasant as ever. What a civilized way to travel. We stayed at El Sardinero, with its huge beach, a wide strand at low tide divided by a rocky spur into the Playas Primero and Segundo. This resort was developed at the end of the 19th century as a Cantabrian rival to San Sebastian. The local government decided to build a vast summer palace for the king on a peninsula at one end of the beach, to encourage this, and many noble villas followed and survive to this day. It has a prosperous feel, with groups of impeccably coutured old ladies chatting away in the cafes as their spouses take exercise at the water's edge or play rapid fire ping-pong. The town was also filled with smart suited boys and girls in white first communion dresses when we were there. The Gran Hotel Sardinero sits right in the middle of all this, its grand Edwardian exterior completely gutted and concealing a very comfortable modern hotel, and we had a lofty, airy room there with a view across the bay. It forms a group with the casino (right), also recently restored. Santander is a great place for long walks, and we managed ten miles a day, west to two rocky capes and a lighthouse, along clifftop paths and past little sandy coves; or the other way, via the shaded landscape of the royal palace to the old town, built around the port on a steeply rising ridge with narrow streets and the typical projecting windows of this region. A very formal shady square, Plaza Porticada, faces the port and from there you can wander the lanes and visit the delightful old Mercado del Este. We ate very well in Santander, mostly in the hotel, which has an excellent menu, although the restaurant is a bit characterless (better to eat in the bar or terrace).